1. The gorilla is the largest living primate, with males weighing about twice the size of females. Competition between males for mates likely led to their large size. A larger, stronger male is better able to guard its troop and defend its females from other males than a smaller male. 2. Like other primates, gorillas have opposable thumbs that enable them to better manipulate,hold,and carry things. 3. Gorillas walk on the knuckles of their hands and the soles of their feet, known as knuckle-walking. 4. Intelligence and memory are helpful for knowing where to find the best food sources. 5. A troop of up to 20 gorillas is led and defended by a dominant male called a silverback. 6. 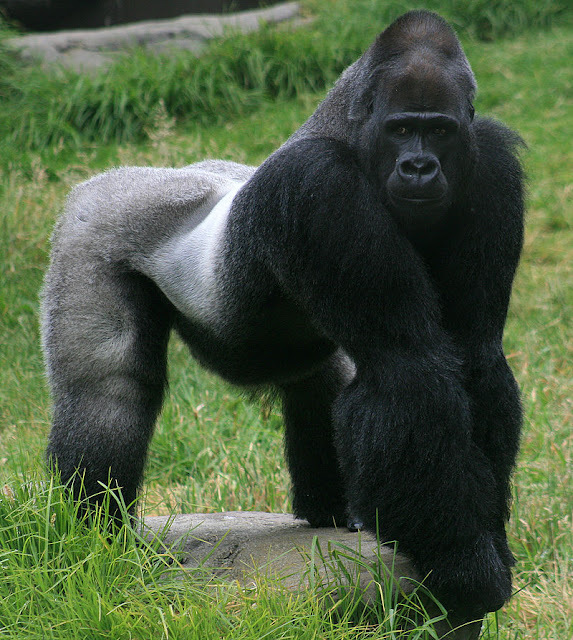 A saddle of gray hair develops across the lower back of mature males, hence the name silverback. 7. Mature males also possess a pad of skin and connective tissue on their crowns which gives their head a conical shape. 8. Gorillas are generally peaceful. They are only aggressive when competing for mates or defending their troops. 9. Males may travel in bachel or groups or on their own until they can establish their own troop. 10. Gorillas communicate through a variety of facial expressions, vocalizations, body postures,and displays. 11. Gorillas were first called Troglodytes in 1847, but renamed to Gorilla in 1852. It was not until 1967 that the taxonomist Colin Groves proposed that all gorillas be regarded as one species. 12. Gorillas also engage in Coprophagia, They eat their own feces (poop), as well as the feces of other gorillas. 13. The Eastern Lowland Gorilla is the largest of the gorillas and the largest living primate. The maximum size of a male Eastern Lowland Gorilla can be over 550 lbs. 14. The western lowland gorilla is the smallest subspecies of gorilla. 15. Gorillas are great apes, along with bonobos, chimpanzees, and orangutans. 16. A gorilla must spend most of its day eating plants to maintain its large size. 17. Gorillas are herbivorous and feed on wild celery, roots, tree bark, pulp, fruit and bamboo shoots. 18. Gorillas and humans are close relatives, and share many things in common. They are very intelligent, have emotions and personalities, and live in family groups. 19. A male gorilla has the strength of up to eight men. 20. Gorillas recognize each other by face and body shape. Each gorilla has a unique nose print, which researchers use to identify individuals they are observing. 21. Gorillas usually feed during the morning and afternoon, taking a break to rest during the noon hours. 22. Gorillas make nests out of branches and leaves to sleep in each night. 23. Gorillas communicate with posture, facial expressions and vocalizations. The chest- beating display of males is a ritualized sequence of nine discreet acts culminating in chest- beating with cupped hands. Its function is most likely intimidation not a threat. 24. Gorillas are the rarest of man-like apes. 25. Every night, gorillas build a nest out of plant material to sleep in and a day nest for their midday rest! 26. Adult male gorillas eat about 70 pounds (32 kg) of food per day. Adult females eat about two thirds of that amount! 27. Gorillas can make up to 22 vocalizations such as grunts, laughs, hoots, barks and screams; each vocalization has its own specific meaning!